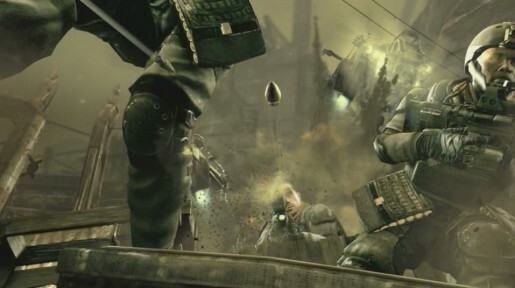 The Sony Playstation 3 game Killzone2, third in the Killzone series of first person shooter games, is being promoted with an online trailer “Bullet”. The video was developed by game developers Guerrilla, agency Deutsch Los Angeles and production house Zoic Studios, Culver City, and released online at the Playstation Network. A soldier fires a bullet in the war on the planet Helghan, lining up for one of the Helghast forces, himself vulnerable to the spray of bullets coming from his enemies. Playstation’s Killzone 2 “Bullet” spot, launching February 25th, is the first ever fully interactive counterpart on PSN: a full 3D version of the spot in which players can navigate their way through the commercial, controlling the camera and hearing director commentary on how the production was completed. Killzone 2 follows the events of Killzone and Killzone: Liberation, and is set entirely on the planet Helghan, the home-world of the Helghast. Two years after the Helghast assault on Interplanetary Strategic Alliance (ISA) colony Vekta, the ISA attempt to capture the Helghast leader, Emperor Scolar Visari, and bring the Helghast war machine to a halt. Players assume the role of Sergeant Tomas “Sev” Sevchenko whose unit is charged with securing the enemy capital of Pyrrhus. The Bullet trailer was developed at Deutsch, Los Angeles, by chief creative officer Eric Hirshberg, group creative directors Jason Elm and Michael Bryce, senior copywriters Jeff Candido and Brian Miller, senior art director Bernie O’Dowd, director of integrated production, Tom Dunlap, executive producer Victoria Guenier, and agency producer Todd Krolczyk. Filming was shot by director Loni Peristere via Zoic Studios, Culver City, with executive producer Aaron Sternlicht, producer Neil Ingram, pre-viz editor Stewart Walks, online/VFX editor Dmitri Gueer, online/Flame artist Chris Stevens, CG supervisor Andy Wilkoff. Killzone2 gaming was developed at Guerilla Games, Amsterdam, by development director Arjan Brussee, art and animation director Jan-Bart van Beek, lead technical artist Paullus Bannink, producer Geert Donker. Music was developed at Terrorbird, New York, by music supervisor Jessica Caragliano and Lauren Ross, using “Caiaphas” by CBMB. Sound was designed at Pop Sound, Santa Monica, by engineer/mixer Stephen Dixon, assistant engineer Nick Bozzone and producer Erin Reilly.